Mississippi's Mike Moore says prescription drug companies are responsible for the nation's opioid addiction crisis. The lawyer who took down Big Tobacco 20 years ago has another intimidating foe in his sights. His opponent this time — Big Pharma. In the 1990s, as Mississippi's attorney general, Mike Moore launched a lawsuit against 13 tobacco companies that eventually resulted in a $246 billion, 50-state settlement. His state lawsuit had become a swarm of suits backed by dozens of states and elite private attorneys, and then a victory that Moore proudly called the "most historic public health achievement in history." He's now using what he learned fighting the tobacco industry to take on pharmaceutical companies, who he says are responsible for the nation's opioid epidemic. "I work on this 7 days a week because I know at the end, maybe I'll be a little bit a part of saving a lot of lives," said Moore, now 66. Moore, who wanted to be a priest when he was younger, now spends his days trekking across the country to build a coalition of officials — like he did when he sued tobacco companies. He's recruited 23 state attorney generals so far. He's even called on President Donald Trump, who declared the opioid epidemic a national health emergency in 2017, to play a role. "Mr. President, is this really a national emergency? If it is, let's get everybody in the same room tomorrow," Moore said. "Let's sit down and resolve this." Chip Robertson, a former chief justice of the Missouri Supreme Court, said that many have tried to do what Moore is doing and given up. "Mike's not afraid of anybody because Mike believes that he's doing the right thing," said Robertson. A veteran of Moore's winning fight against Big Tobacco, he has now joined Moore's team of top-flight attorneys and state and local officials in the battle against Big Pharma. Opioid addition in the U.S. has increased sixfold since 1999 and overdoses now claim more than 115 lives every day, according to National Institute on Drug Abuse research. About 75 percent of those who began abusing opioids in the 2000s reported that they started on prescription drugs. Moore calls pharmaceutical companies "pretty evil" and claims that they intentionally lied about the addictive properities of their drugs. Since 2014, he and his cohorts have filed multiple suits against manufacturers of prescription opioids. His home state of Mississippi was the first of 10 states to sue the drug companies. 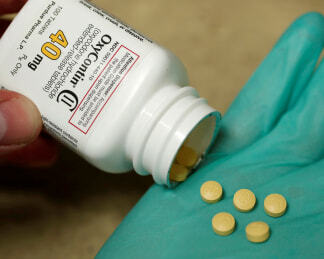 Many of the suits name Purdue Pharmaceuticals, makers of the presription painkiller OxyContin, as a defendant. In 1998, Purdue released a promotional video that asserted that "the rate of addiction among pain patients who are treated by doctors is much less than one percent." "When you train your workforce — thousands of salespeople — to go out and tell doctors that there's less than a one percent chance of addiction if you take this drug, and you know that there's no study that you've done, and no reliable study that anybody else has ever done that says that, then of course you're telling a lie," Moore said. Purdue told NBC that Moore's assessment is "deeply flawed," claiming that its drug oxycontin represents less than two percent of current opioid prescriptions. According to Purdue, "illegal trafficking and abuse of heroin and illicit fentanyl" is the real culprit inAmerica's opioid epidemic. The corporation welcomes presenting its "substantial defenses" to Moore's allegations in court. After 16 years as attorney general, Moore went into private practice in 2004. He specializes in conflicts between government and major corporations In 2017, he notched another big win, helping oversee negotiations between BP and five states and nearly 500 municipalities that led to a $20 billion legal settlement for damages from the 2010 Deepwater Horizon oil spill. When he decided to fight Big Tobacco all those years ago, Moore says, even his mother questioned his judgment given the power and deep pockets of the opposition. But his then unorthodox legal strategy worked, and he thinks he can use the same approach to win again. "I'm going to win this fight. I'm going to keep kicking 'em until they give up," he said. You can read the full article by Rich McHugh and Likhitha Butchireddygari here.